Ortho-K means less symptoms of contact lens related daytime dryness compared to some regular contact lenses. Ortho-K aims to reduce your reliance on glasses. Ortho-K can be worn by children, teens and adults once suitability has been determined. Ortho-K has the potential to slow the increase in shortsight in children and teenagers. Harmony Vision introduced Ortho-K or Orthokeratology to the Gold Coast in 2003. We have a great deal of expertise and experience in this technology. We don’t stick with just one brand of Ortho-K technology. Our experience has been that by having a number of technologies available we are able to fit a wide range of prescriptions and eye shapes, compared to the limitation of just a single brand. While not every prescription is suitable for Ortho-K, new lens designs allows an increased range of prescriptions to be corrected. Once found to be suitable for Ortho K, you are fitted with and wear an individually prescribed Ortho K lens on each eye while you sleep. The lens gently reshapes your eye while you sleep. 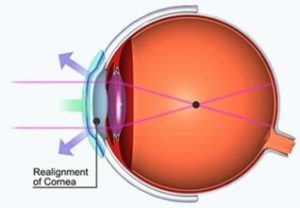 You need to wear the lens every night or every second night, depending on the level of correction, to maintain clear sight. The current technology means good vision can be achieved in up to 4.00D in most cases, up to -6.00 D of myopia/shortsight in some cases. In selected cases up to -10.00D of myopia, low levels of hyperopia /presbyopia/ longsight, including small to moderate levels of astigmatism. Higher prescriptions (over -6D of myopia and/or higher degrees of a astigmatism) are possible, but need careful consideration of your individual eye-shape and visual needs. Recent advances have increased the success in this prescription range. People who have previously had laser eye surgery may be candidates but the results are less predictable and the fitting process can take longer. Ortho-K is not just for adults. Myopia can increase the chances serious eye-health issues in later life. So it is important to treat the myopia itself and not just the symptoms of poor eyesight. This has life-long benefits in eye health and life-style. Clinical research shows that Ortho K is one of the most effective current options that can help reduce how quickly your child becomes more myopic. While myopia control cannot be guaranteed to happen in every child, Ortho-K will still give each eligible child good sight all day. While no complications have been experienced in Ortho-K research studies, worldwide there have been a small number of cases of microbial eye infections have been reported with the use of Ortho K. So like regular contact lenses, Orthokeratology does require you to maintain good hygiene of hands and lenses to minimise the risk of an eye infection and the rarer risk of vision loss, especially because the lens is being worn while sleeping. *Orthokeratology has been developed over many decades, and many people enjoy the benefits of this treatment, but the results cannot be guaranteed for every individual. Your optometrist will discuss the expectations for your individual situation.